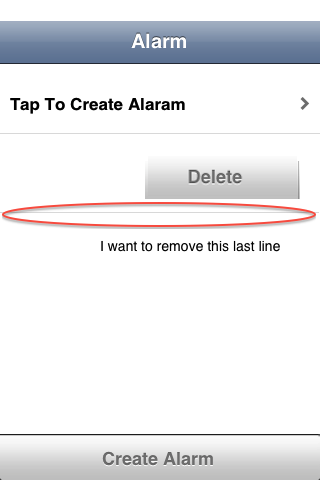 In my app, I use a UITableView My problem is that I want to remove the last border of the last cell in UITableView. Add this line of code in viewDidLoad(). This make sure the last separator will be replaced and replaced (invisible) footer view will not occupy any extra height. Since the footer view's width will be managed by UITableView, so you can set it to 0. Nope, you can't do that. These separators are pretty cut and dry, style and color that's it. However, an alternative solution could be to turn off separators all together and set a background image with a horizontal line at the bottom for all cells except the last. Here is the remedy I currently use. it might not be the best approach, but it works. Below code helps me to remove the separator from last row in a UITableView. The .h should only contain property declarations for hideLastSeparator and hideLastSeparatorView. When wanting to hide the separator, use the new class and set myTableView.hideLastSeparator = YES. The way this works is by obstructing the last separator by adding a new view over it. This is somewhat easier to use in my opinion (than using a custom separator, or setting the last separatorInset of the last cell), and avoids some weird animations that the method of setting a tableFooterView sometimes causes (e.g. during row insertion/deletion or other table animations). If you don't want a separator for one particular cell, consider drawing your own separator and set tableView.separatorStyle = .none.